Reachers > Ergonomic Reacher Grabbers Buy 2 -- Just in case! An ergonomic reacher tool is a reacher typically with an angled handle that accommodates the natural angle of a grip. While an ergonomic reacher tool might feel more comfortable when holding it, it's possible that the angle difference between the ergonomic reacher tool and your arm might take some getting used to. Something else to watch with an ergonomic reacher tool is that there may be claims that the design will be better for you in the long run, but it may pay to try one out before buying. An ergonomic reacher tool can be difficult for someone to use if they have severe finger weakness at the tops of the fingers. Some makers of ergonomic reachers also utilize a rotating claw. This could make using a reacher easier, but again you probably want to try it out and make sure. 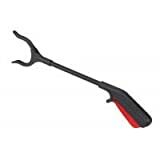 Mabis Ergonomic Plastic Reacher, 18"
Available in 26" and 32" lengths., Jaw rotates for horizontal and vertical use., Minimal effort required with efficient ergonomic design., The Duro-Tek Plus Reacher has an ideal 3" jaw opening that is perfectly sized for cans of food or glass retrieval. 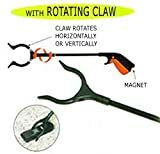 Ergonomic Plastic Reacher with Rotating Claw 18"
Jaw rotates for horizontal and vertical use., Easy-to-use ergonomic trigger polycarbonate handles, Attached magnet picks up light metal objects., Minimal pressure required., Great tool for hard to reach items.